Zannie Jackson is in a life or death situation. Having lost use of both kidneys, he must undergo dialysis treatment four times a week. As he waits for a matching kidney that may never come, Zannie must also deal with his home being in foreclosure. Strengthened by his love for his 12-year-old son, he refuses to give up on his dual fight against his potentially fatal illness and an impending foreclosure. 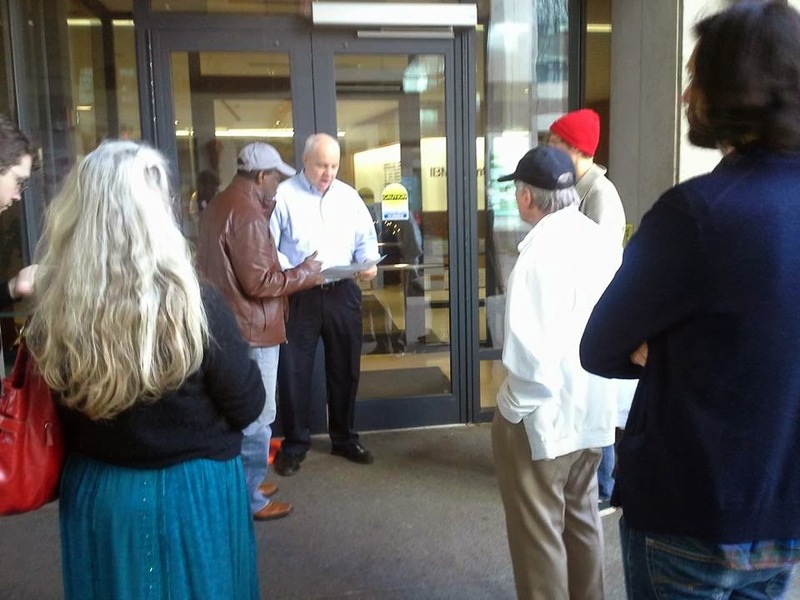 Today, Zannie and over a dozen supporters delivered a petition signed by over 900 people to IBM --- the company owns Seterus, who is the loan servicer trying to foreclose on Zannie's home. It was a surprise to discover that IBM was getting into the mortgage business, less of a surprise that they are choosing to do it by branding a no name corporation to do their bidding. 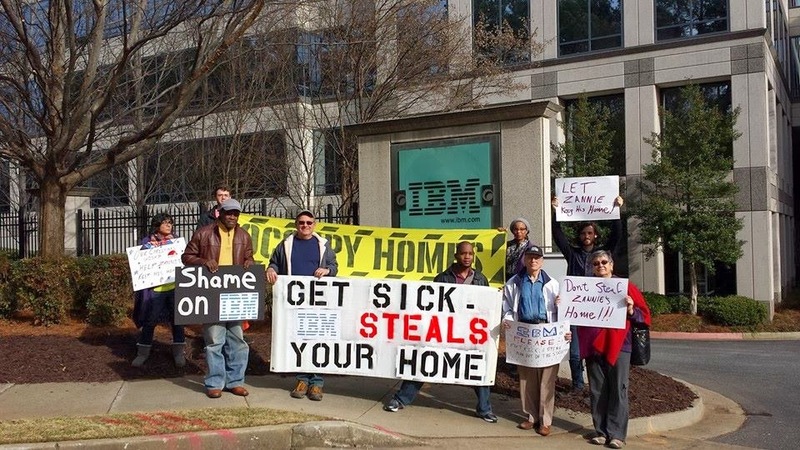 After IBM received the petition we held a demonstration outside IBM to make it clear that this would not go away. CBS cover the story on their 5 and 6pm newscasts. 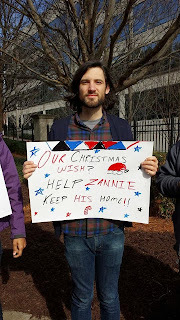 ‘Tis the season for giving and it is our hope that Seterus will negotiate a deal with Zannie that works with his disability income. Bank of America has already released him from his second mortgage; now it’s IBM’s turn to do the right thing. The reality here is that if IBM owned Seterus modified Zannie's loan based on the real calue of the home it could be a victory for Zannie and IBM's Seterus. Zannie would be able to afford his payments, and Seterus would pull a profit and put an end to a public pressure campaign that's sure to escalate. American Friends Service Committee is excited to support Zannies campaign, which is being led by Occupy Our Homes Atlanta. Please sign and share Zannie's online petition by clicking here. 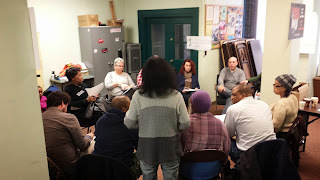 This past Saturday was jam packed with a lot of exciting housing justice work! Saturday morning I had the opportunity to meet with residents of the Peeples town community to talk about the housing crisis. 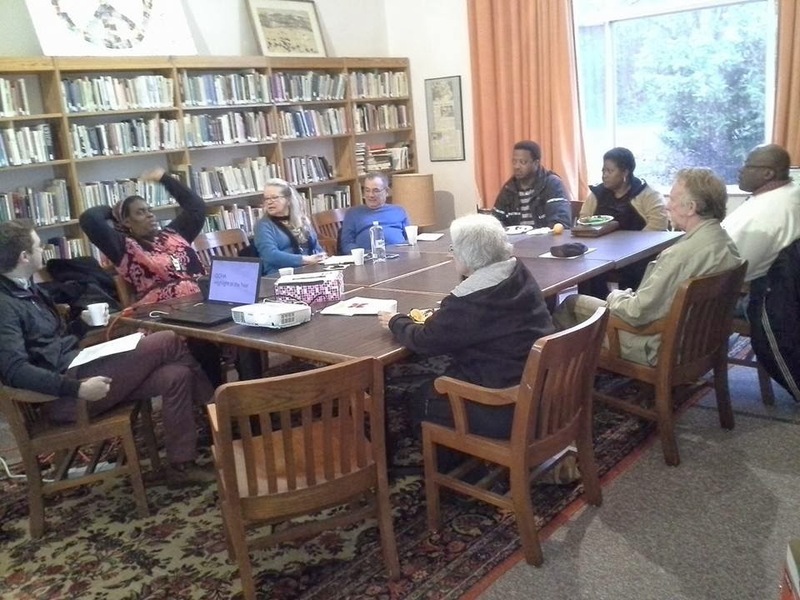 There had been talk about the possibility of working on a community wide initiative to address the issue of foreclosures, evictions, lack of affordable housing, and vacant homes. We purposed moving forward with a community wide listening project in late January early February. A listening project is a different way to engage with a community. Instead of telling folks what they need or what you can offer, a listening project assumes that folks that live in the community have the best ideas about what they need. Listening projects are a way of finding out what a community would like to see change. The idea was very well received with multiple residents volunteering yo help do interviews door to door for the listening project. Super excited to move forward on that project next year! 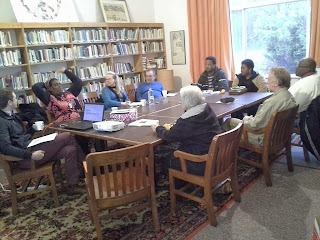 All day the Atlanta Friends Meeting House hosted Occupy Our Homes Atlanta's year end member retreat, at which AFSC had a seat at the table. The retreat is an opportunity to reflect on the last year of work, look at the goals that were set last year, evaluate what was accomplished and what areas still need work. 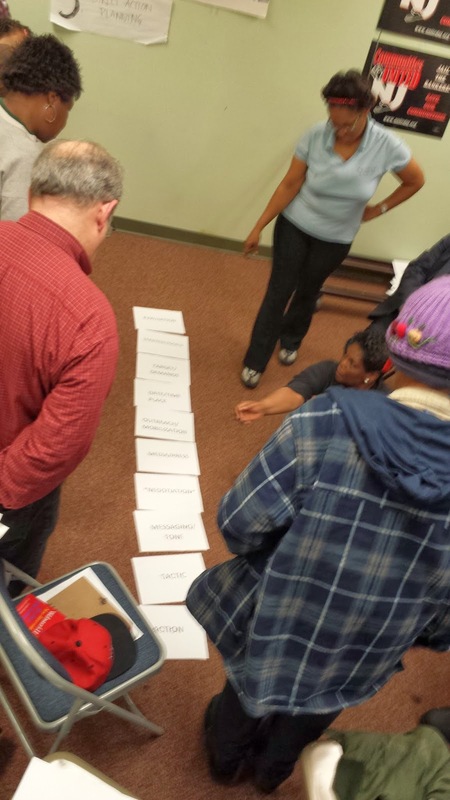 There was also space to set new goals for 2014, one of which is the listening project in Peeples town! 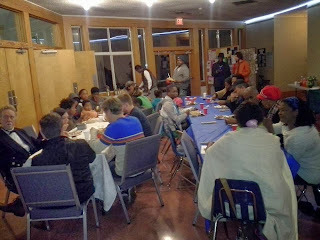 To top off the night we had a holiday party at the Atlanta Friends Meeting House with delicious food, lots of folks, and music. It's important to create space to reflect and celebrate our work and each other. It's hard work, which is why so many call it struggle, which makes it even more important to lift up our victories. BIG thanks to the Atlanta Friends Meeting House! 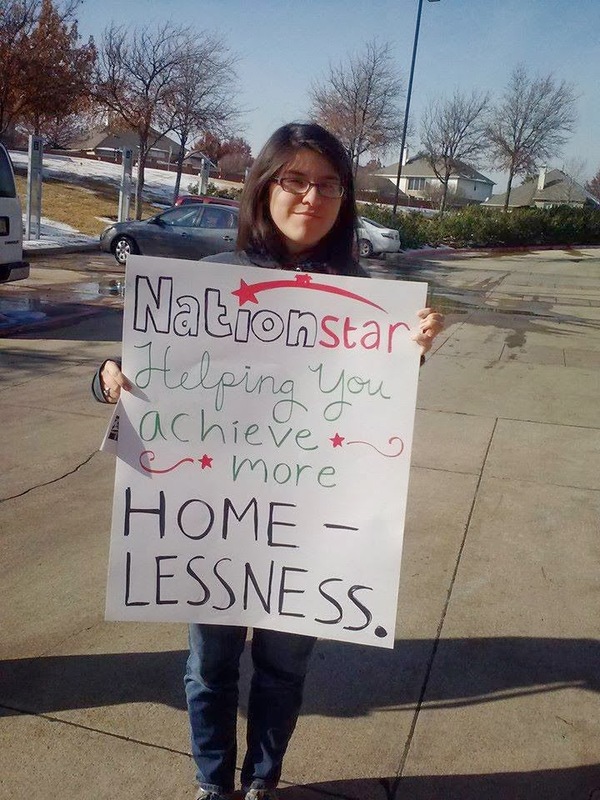 Nationstar Mortgage Get's a Surprise Deliver! Nancy Daniell, a senior citizen in Gwinnett County, has been an active community member at Berkeley Woods Condominiums since 1996, serving on the Board of Directors of her homeowner’s association and using her condo as a communal gathering space. After being laid off from her job in 2008, and facing an abysmal job market, her income from social security and a string of temporary jobs was no longer enough to keep up with her mortgage. She was denied a loan modification by her initial mortgage holder, Bank of America, forcing her to deplete her savings and file for bankruptcy. Recently Nancy's loan was sold, with millions of other peoples, to Nationstar Mortgage. Not that we've linked to Nationstar's Facebook page instead of their regular website just so folks can get an idea of how difficult the mortgage holder is to work with. One reason why Bank of America has unloaded so many mortgages to Nationstar is because Nationstar isn't accountable to the National Mortgage Settlement like Bank of America is; of course this is very troubling. 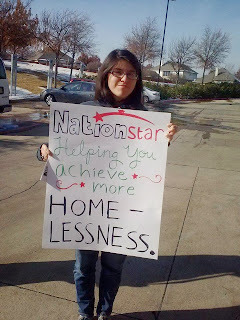 After several months with major communication problems including the accidental foreclosure sale of Nancy's home and the inability to get a single point of contact as promised by Nationstar, we decided to escalate by organizing a demonstration outside Nationstar. But there was a problem in Georgia. Luckily the housing justice movement is growing in this country, and we have allies almost everywhere. Turns out Folks in Dallas Texas, where Nationstar's headquarter are, we more then happy to organize a solidarity action for Nancy! So last week about a dozen folks delivered Nancy's petition(which you should sign if you haven't already). 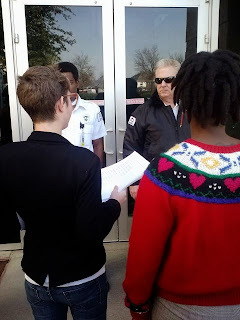 They held a demonstration outside Nationstars headquarters and passed out fliers to folks passing by. Now while this fight isn't over yet, Nancy had this to say, " I am overwhelmed with gratitude for these friends & apparently Nationstar was a bit overwhelmed as well. I got a phone call later that afternoon from Taylor Pettigrew, a public relations specialist at Nationstar, who very politely assured me that Nationstar wanted to work with me in every way possible & asked for some more documentation regarding my loan application. I am now putting together that documentation & we shall see what happens next. Many thanks & Happy Holidays to all those who have signed my petition, sent good wishes or participated in any positive way with my fight to remain in my home!" 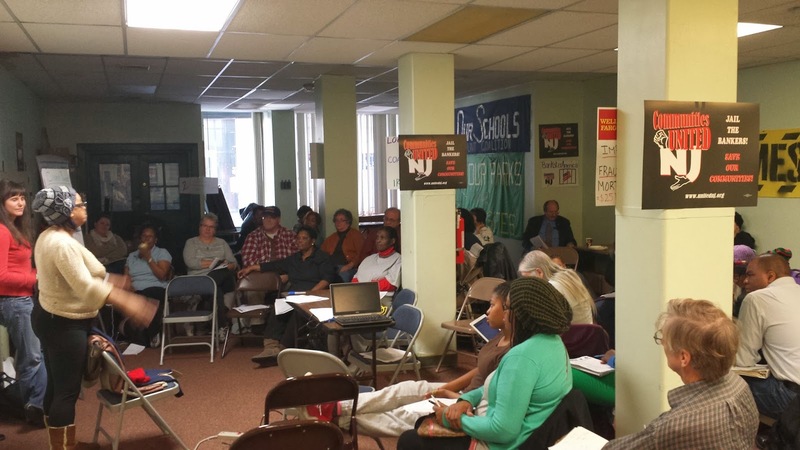 Housing Justice Academy, Jersey Style! 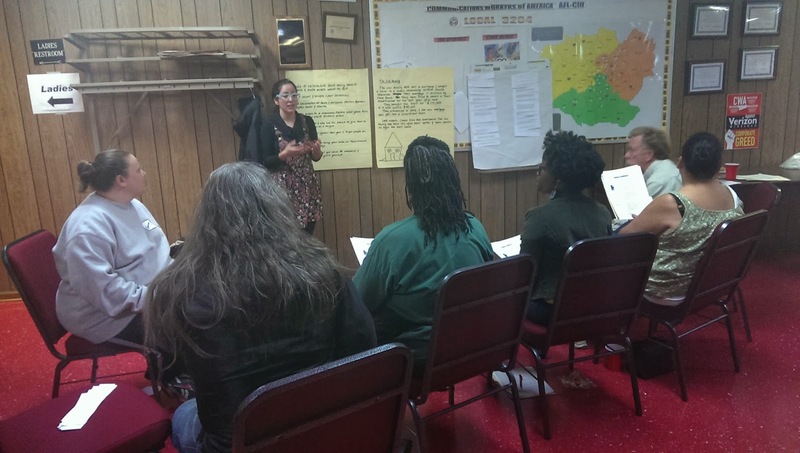 Today marked day one of the third Housing Justice Academy and like the first two, it seems to be a success so far. In Newark NJ over 50 resident fighters and allies came out to learn how to organizer home defense campaigns using public pressure and direct action. Newark was hit hard by the housing crisis leaving many communities littered with bank owned vacants and thousands owing mush more then their properties are worth. Like many states big bank settlements(hardest hit funds) are not trickling down to the hardest hit in New Jersey, instead being used by the state's Governor to balance the general budget. Just one day into the Academy and residents are already planning out their first campaigns and strategies about what it would take to organize multiple eviction free zones. In Irvington, the city next to Newark, the mayor and members of city counsel have announced their intention to pursue eminent domain as a strategy to reclaim homes from multiple banks, bringing immediate relief to struggling home owners. Lots to be excited about in New Jersey! To our count well over 60 Georgians visited our table at the School of the Americas Watch in Columbus Georgia, they were joined by thousands more from around the country. American Friends Service Committee worked with Georgia WAND and the Georgia Peace and Justice Coalition to staff a table at the gates of Fort Benning. 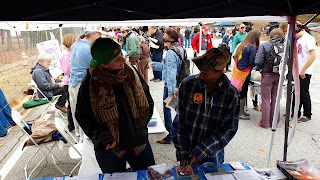 We gave out hundreds of our "One Minute for Peace" handouts and had lots of great conversations about our work. I was very grateful for youth at Quaker Volunteer Services who helped staff the table. 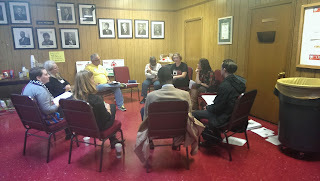 In the afternoon we had a really well attended Georgia Activist meet-up, it's the 10th one AFSC has organized. 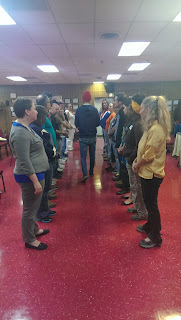 It was wonderful to have space for Georgians doing work around a variety of issues(from nuclear disarmament, to housing, corporate accountability, and more) from different parts of the state together in the same room with the intention of building bridges between issues and making connections with folks around the state. It is in making these important connections that we create the potential to be more than the sum of our parts; to change the political landscape of Georgia! There's still more to come for the years SOAW, and there's still time to come! Click here for details! This weekend Thousands will gather at the gates, with speakers, music, street theater, workshops and networking with people from across the Americas. 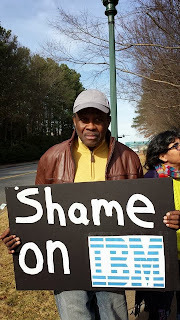 We come together at the gates of Fort Benning for the School of the Americas Watch(SOAW) - where the killers are trained - to demand an end to US militarization and to impunity. The Vigil weekend is an opportunity to connect your communities with those across the hemisphere who are resisting Empire. In addition to the main funeral procession on Sunday, November 24, there will be rallies, concerts, and over 70 workshops. 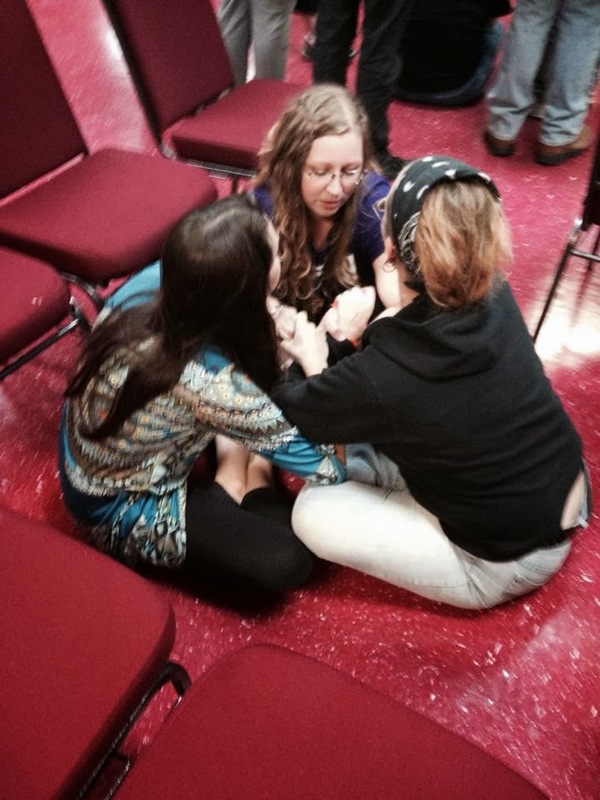 To Learn about the movement, it's purpose and history click here. Every year American Friends Service Committee works with the Georgia Peace and Justice Coalition to organize housing and transportation to SOAW. We also staff a table and organize a Georgia Activist meet-up. 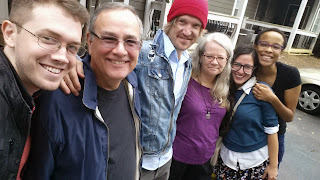 This year 13 of us left Friday afternoon, and met even more folks once we arrived in Columbus. We'll be here all weekend, it's certainly not too late to join us! Click here for details on the Georgia Acttivist meet-up details! 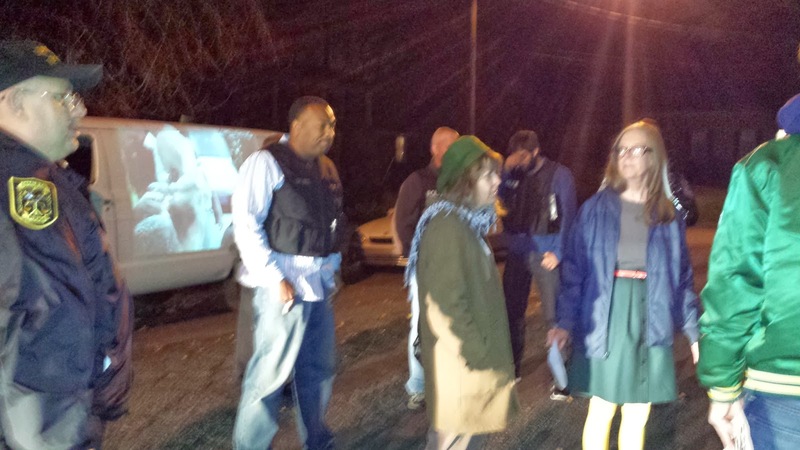 For the past 15 weeks, supporters of Veteran MarkHarris, who was evicted at gunpoint by Fannie Mae, have been holding a candlelight vigil in front of Fannie Mae VP, Candy Lasher's home. 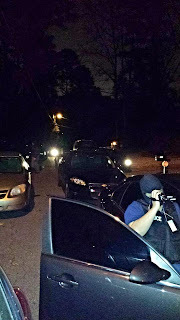 Tonight, over 15 DeKalb county police officers, many in tactical gear, were sent to break up the peaceful vigil, threatening everyone with citations and arrest. American Friends Service Committee has been involved in Mark's campaign for the last year and has had a presence at every candlelight vigil. It was a truly horrifying scene to experience first hand, there was a feeling that anything could happen to us in what seemed like a militarized zone. In 1984 we moved to DeKalb County and bought our first home. My baby was born in this house; he attended public school from kindergarten through high school; and he is now married and a mathematics teacher. 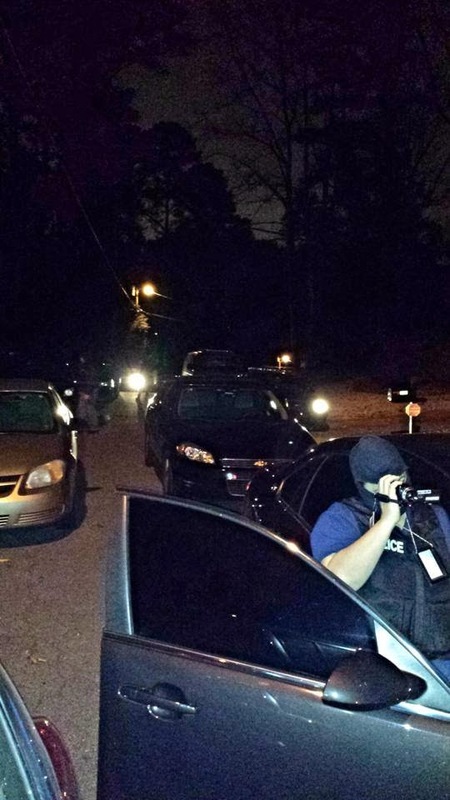 My DeKalb County police officers have always been there for me; from protecting the children at school to patrolling my house when I was out of town to going door-to-door to check on our safety the night a neighbor was violently assaulted in her home. They even counseled us after the young hiker was murdered by a horrible serial killer who frequented our neighborhood park. As moms, we always told our children that if they were ever in trouble they should run to the Policeman. Mark after Fannie Mae evicted him from his home of eighteen years. was no Osama Bin Laden. vehicle to intimidate seven citizens (three of them seniors) is an outrage. 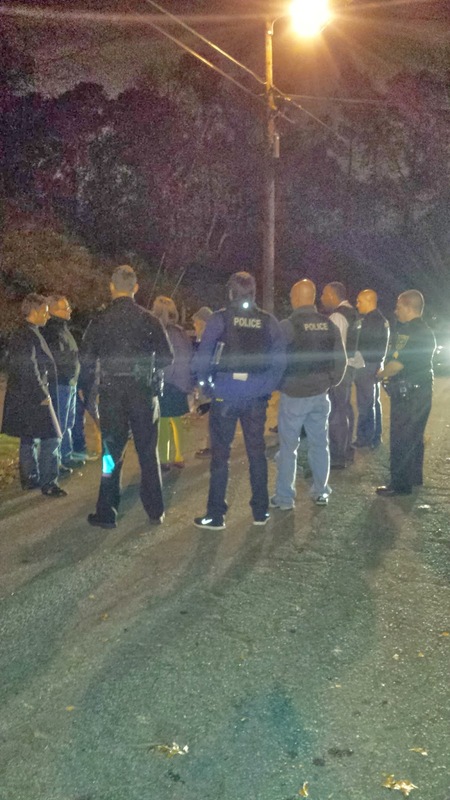 sexual assailants - for the police to stop. 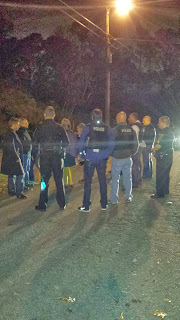 Tonight I feel so disappointed by the police officers I have always trusted. I feel scared of the officers I thought would protect me. regular person like me or an honorable Veteran like Mark? "It's My Life" 2014 Youth Film Festival Officially Launched! 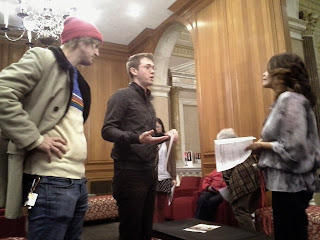 Yesterday organizers of last years, "It's My Life" Youth Film Festival met last night to discuss how to move forward. Last year's event was an experiment to ended up going really well. The decision was made to book the Plaza theater again and move toward building a bigger better film festival!! 2014's festival will go down April 29th, with the deadline for submissions being April 16th. One big change is that we have changed the age requirements to 23 years old and below, which opens things up a bit. Last year was a lot of fun and sparked a lot of really important conversations across high school campuses all over the metro area. We need help to pull this off. If you want to help us make 2014's "It's My Life" film festival a success please join us Tuesday December 3rd at 7pm at American Friends Service Committee! Read about 2013's "It's My Life" Youth Film Festival here! 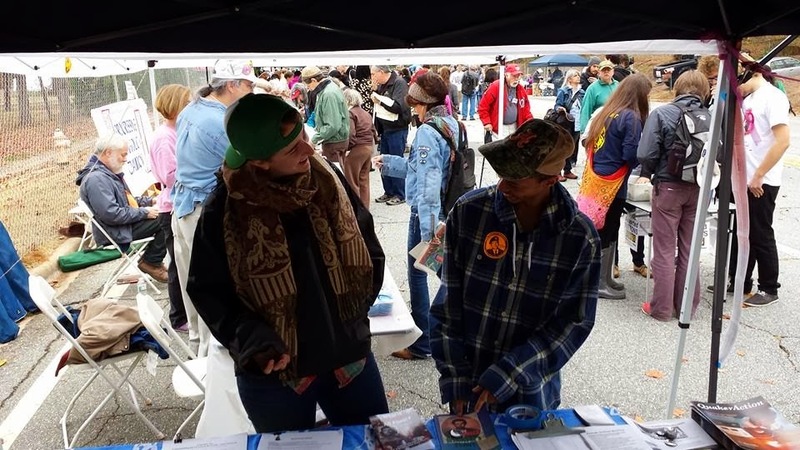 Supporting Nonviolence In Action Here In Georgia! In the last 24 hours two very principled, brave, young men decided to put their freedom on the line to expose an injustice and create public pressure for policy makers to do the right thing. 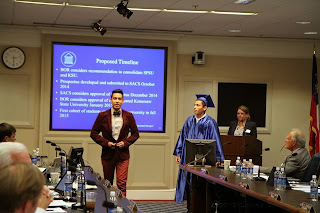 The two courageous undocumented students - Yovany Diaz and Eduardo Samaniego - were removed from the Georgia Board of Regents' meeting in Atlanta and arrested. They were standing up against the Board of Regents decision to ban undocumented student's from paying instate tuition and attend college in Georgia. 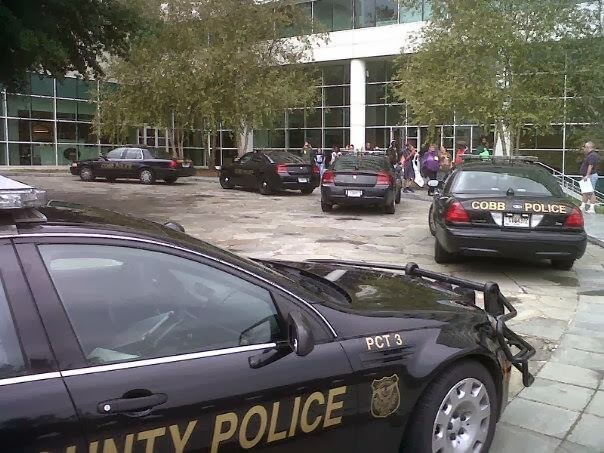 They were detained in Fulton County Jail, the same jail where Dr. Martin Luther King Jr was held in October 1960. 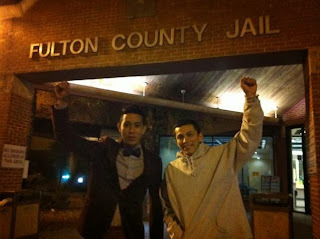 Happily both of these young men are out of jail because of a very supportive legal team, a strong base of community support, and a little help from the Georgia Civil Disobedience Support Fund. The fund was created during the successful campaign to defeat 2012 Senate bill 469, which would have made it illegal to picket in front of a non-public building and it would have made it almost impossible for organized labor to exist in the state. A broad coalition was created to defeat the bill, and over 50 people publicly committed to nonviolent civil disobedience if the bill passed. This commitment prompted some of use to prepare to cover bail costs. In the end the bill was defeated! What were we to do with the money we raised to cover bail costs? It would have been almost impossible to give it back to people, as it was collected in at events, and small contributions online from all kinds of different people. We could have split it up between groups that anchored the campaign, but that seemed messy and in the end wouldn't have amounted to that much once the split was made. After much discussion the decision to create a new piece of infrastructure to support principled nonviolent direct action and victims of politically motivated targeted arrests was made. 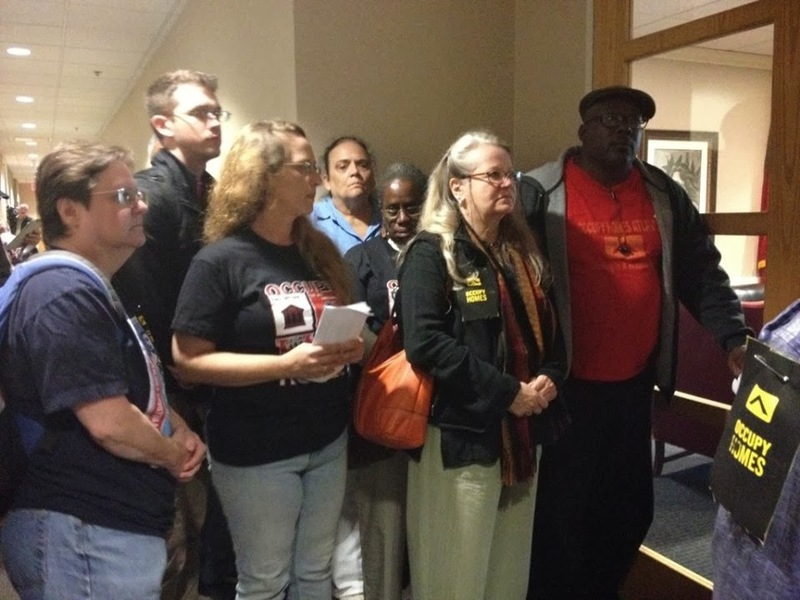 Representatives from the Atlanta Economic Justice Program for the American Friends Service Committee, Atlanta Jobs with Justice, and the Georgia Peace and Justice Coalition have taken custodial responsibilities for the fund. It's a fairly new infrastructure piece in Georgia and a process for applying to use the funds is still being developed. As we take time to figure out the best way to promote the fund, replenish and grow the fund, and have a clear simple application process, we continue to make the fund available for crisis situations. The fund has been used several times in the last few years and we hope that it continues provide support for those engaging in nonviolent civil disobedience. To contribute to the fund simple click here. 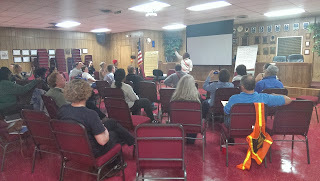 Housing Justice Academy Sparks a Fire! 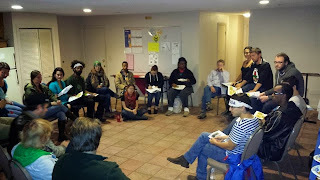 For the last several months the American Friends Service Committee has been working hard alongside Occupy Our Homes Atlanta to bring struggling homeowners, tenants, and housing justice organizers from around the south east together for a crash course in how to spark local housing justice groups. Leading up to the academy there were several visits to communities all over Florida and Tennessee to build moment for the academy and build capacity to do housing justice work in the South. The Academy was held last month and brought folks from all over the south to participate in an intensive three day curriculum designed to arm people with all the tools to build a thriving housing justice movement in their communities. It was especially exciting to have multiple residents prepared to launch local campaigns around their own housing struggles. On day one we focused mainly on political education and leadership development through storytelling exercises. We also facilitated an amazing interactive step by step tour through the housing justice campaign model we've developed over the last two years that has lead to dozens of local victories. 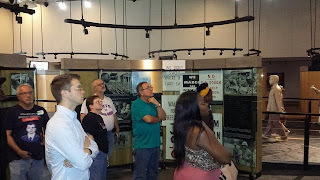 On day two we focused on nonviolent direct action training and took a field trip the Martin Luther King Center for Nonviolent Social Change. Day there was on the job training as we took to Senator Johnny Isakson's office to demand that he not block a vote to confirm a permanent director for the Federal Housing Finance Agency (FHFA) which oversees Fannie Mae and Freddie Mac. Read more about the action here. After the action we had a graduation ceremony. Since the academy there has been a lot of exciting of developments with graduates. 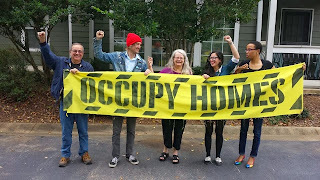 There's been a recent launch of Occupy homes Florida, Occupy Our Home Orlando, and Occupy Chattanooga continues to build momentum around their multiple housing justice campaigns, they also had some great press converge of the academy; click here to see! As we continue to see thousands of people in our communities left behind in a housing recovery that sees the overwhelming percentage of empty homes, homes lost by real people, bought up by private equity firms with the intention of securitizing the rental market, it's exciting to see new energy organized to take back our homes one house at a time. We simply can no longer afford to allow the same small group of people to treat the most basic necessities of survival as a way to extract wealth from those that have so little. We simply can no longer afford to see the ratio of homeless people to grow far beyond the number of abandoned housing units. We simply can't afford the ever decreasing number of affordable housing dwellings in our communities. We know there are enough resources in this country to provide a place to call home for all of us. 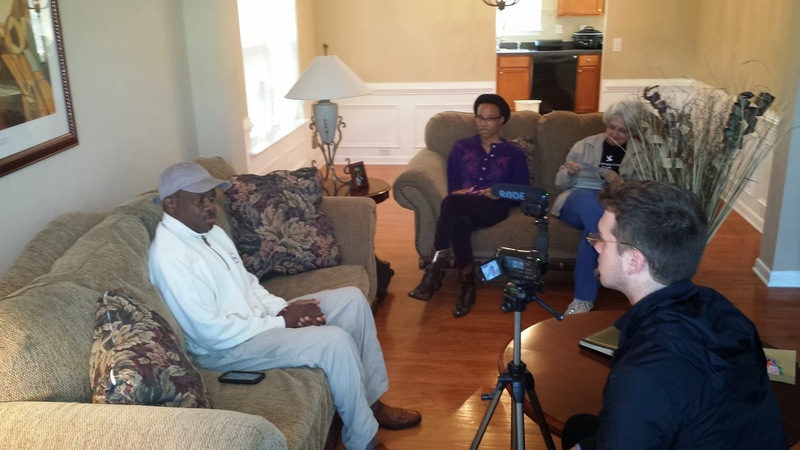 Zannie Jackson bought a home for his family in 2005, he invested countless dollars in fixing it up only to see the market crash as a result of irresponsible and fraudulent bank practices. In 2012 Zannie was diagnosed with renal kidney failure. Zannie's story is sadly not a new one, get sick, lose your home. This past Tuesday Zannie had to undergo surgery on his arm to fix a valve that goes yo his heart. Zannie is currently in recovery from the surgery, and while he is on a kidney transplant list, Zannie's life is at serious risk. Despite Zannie's dire situation Bank of America has been unwilling to return his calls and work with him. 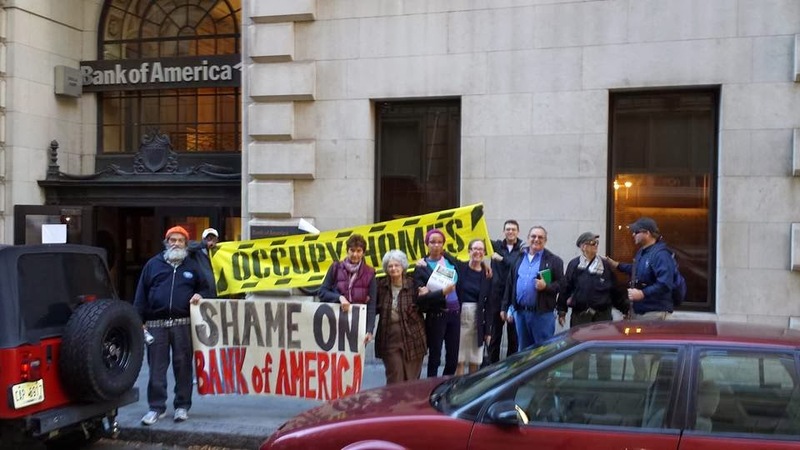 Today a group of us marched to Bank of America and asked to speak with the manager. We informed the manager of Zannie's condition and expressed our concern that the bank had no communicated with Zannie about his mortgage issues. 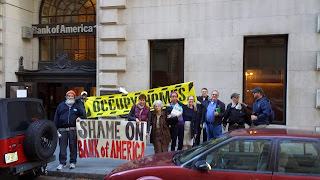 We made it clear that we were there to simply deliver a letter to Bank of America and make it clear that we were not going to sit back and watch a dying man tossed onto the street. The branch manager, who seemed prepared for our visit appeared very nervous and stern. 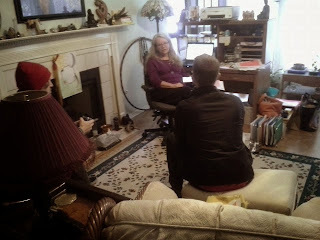 She refused to accept the letter despite our assertions that Zannie is in the hospital and might not survive the year. We left the letter and picketed outside the branch until it closed, distributing flyers that told Zannie's story. 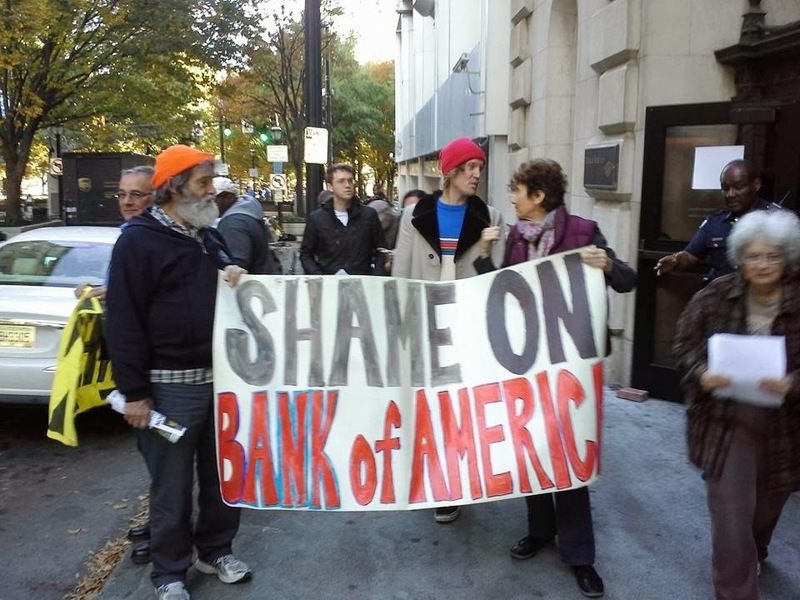 We hope that Bank of America decides to do the right thing and work with Zannie, our communities don't need more empty houses and our streets don't need more homeless people. Zannie Jackson is now fighting to save his life and stay in his home. With failing kidneys, he spends four hours a day, three days a week, in dialysis treatment. Zannie has been undergoing dialysis treatment for two year now. In the meantime, Bank of America, Seterus Corporation, and Fannie Mae, are trying to take his home. As a single parent his home has provided shelter for his son and a safe heaven for him to get healthy. Just recently Zannie made it onto a kidney donor list at Emory hospital, giving him a light at the end of the tunnel. However, Bank of America is getting in the way of that. They are refusing to work with him on the second mortgage that has made his home unaffordable on his fixed income. Instead of working with him they are actively trying to put him on the streets and take away his safe haven, which would harm his health even further and possibly cost him his life. The callousness of our financial institutions is made apparent in situations like these. The paradigm that Bank of America, and their government-owned backers like Fannie Mae, operate under is one in which health problems and crises of any kind result in near-immediate homelessness. 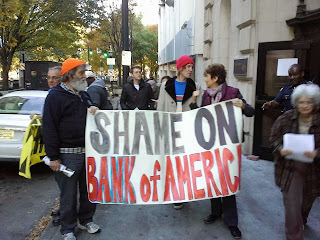 Zannie has been trying to work with Bank of America for months, and they have refused to budge. They would rather see an ill man die in the streets before accepting lower payments while he waits for a kidney transplant. Today Zannie made a commitment to stand up to Bank of America and Seterus stating, "I have no where else to go, there's no plan B". We urge Bank of America and Seterus to do the right thing and work with Zannie. 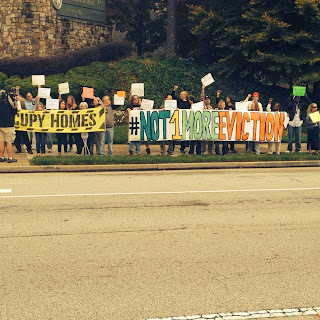 Our communities need real solutions, not evictions. Next Thursday at 3pm Zannie and his supporters are planning a rally in from of Bank of America downtown. Click here for details. Please sign and share Zannie's online petition. Today struggling homeowners fighting mortgage giants Fannie Mae and Freddie Mac, along with housing justice activists from across the southeast, converged at the office of Senator Johnny Isakson in Atlanta to demand that he does not block a vote to confirm a permanent director for the Federal Housing Finance Agency (FHFA) which oversees Fannie Mae and Freddie Mac. This group includes Mark Harris, a Desert Storm veteran evicted at gunpoint by Fannie Mae last August from his home in Avondale Estates, Nancy Daniell, a senior citizen whose Duluth home was wrongfully foreclosed on by Nationstar on behalf of Freddie Mac, and Zannie Jackson, a Fannie Mae homeowner and dialysis patient worried about keeping a roof over his head in addition to fighting for his life. Monday's action is the culmination of Atlanta's Housing Justice Academy, a three day training in home defense and non-violent direct action, attended by homeowners, renters, and activists from around the Southeast organized by the American Friends Service Committee and Occupy Our Homes Atlanta. At around 1pm fourty home defenders, many of whom are at risk of losing their homes, entered Johnny Isakson's office building where we were immediately told that we would not be allowed into his office despite the fact that folks had driven hundreds of miles to meet with someone from the Senator's office. Finally we decided to go up to the senator's office anyway. Once outside his office we were refused admittance and told no one would meet with us today, which didn't stop us. We stood outside the office until someone met with us. A staff opened the door and offered to meet with us in the doorway without allowing us through the door. 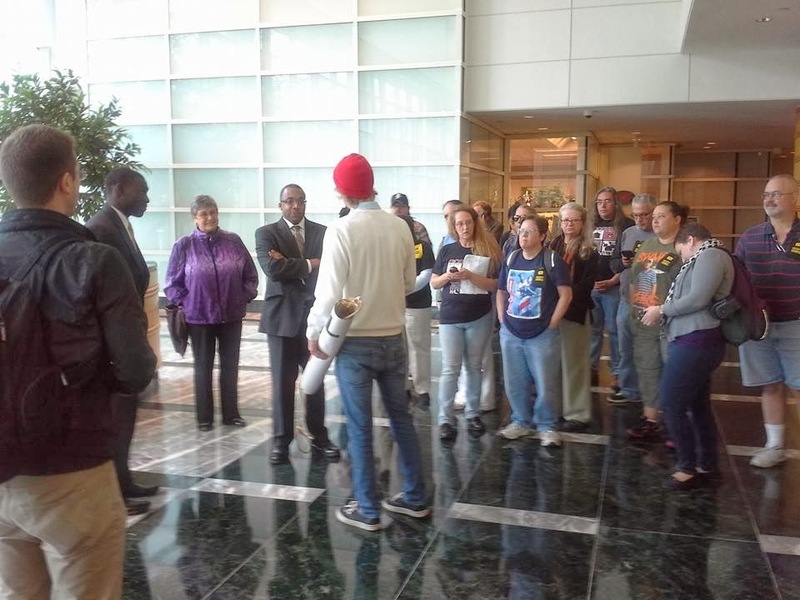 They basically wanted to take whatever information we had on paper and be done with us, instead we had a line of struggling residents ready to tell their stories and let Senator Isakson's staff understand what appointing a permanent FHFA director could mean for folks. After several residents shared their story's we then unrolled a large banner that said "#not1moreeviction". The group spent another hour or so outside the senators office holding signs and granting press interviews. A vote in the Senate to confirm a new director of the FHFA will happen early this week. As this confirmation hearing approaches residents are advocating for a confirmation of a permanent Director of the FHFA. Since Senator Isakson and his fellow Republican congresspeople have threatened to filibuster Watt's confirmation, the residents staged a "filibuster" at Isakson’s office, by sharing the laundry list of violations and injustices of the FHFA. The confirmation of a permanent director FHFA could mean principal reduction for hundreds of thousands of struggling American homeowners. It could also mean the turning over of Fannie Mae/Freddie Mac vacant properties over the community organizations for the use of affordable housing. Similar protests will be taking place around the country on Monday as part of a national day of action to demand that there is "Not 1 More Eviction" until a new permanent director is confirmed by the Senate. These actions are part of the larger movement to "Dump Ed DeMarco," acting Director of FHFA, and reverse his policies that have been devastating to both homeowners and renters. More than half of all mortgages in the US are managed by Fannie Mae and Freddie Mac. Even with all the current talk of housing recovery, 13 million homeowners are still underwater.FHFA’s continued refusal to reduce principal to current value has hurt the economy, pushing millions of homeowners into the streets. Click here for Mark Harris' story and petition. Click here for Nancy Daniell's story and petition. Click here for Zannie Jackson's story and petition. Click here for Sherri Joubert's story and petition. 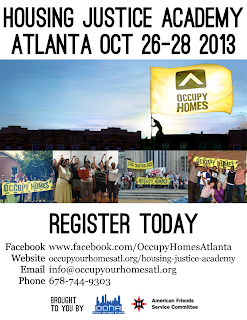 Click here for more information on the Housing Justice Academy. Senior Citizen's Home Foreclosed Due To Mortgage Servicer's Mistake. 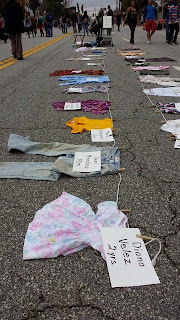 Two weeks ago, just days before her home was scheduled to be auctioned off on the Gwinnett County courthouse steps, Nancy attended an Occupy Our Homes Atlanta meeting at our AFSC Atlanta office, scared of losing her home and seeing her belongings put out on the street. 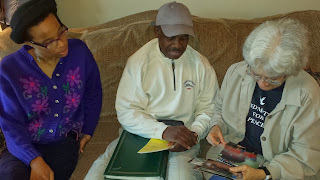 With some last minute phone calls and help from the Rainbow Push Coalition, our coalition was able to get the foreclosure sale postponed indefinitely, giving Nancy more time to work out a solution. Her new servicer, Nationstar Mortgage, even sent her a letter confirming the sale was cancelled, and notifying her of her new single point of contact. From there, everything has gone downhill. When Nancy tried to call the single point of contact listed, she was transferred from one person to the next, all of whom told her that her home had been sold in foreclosure and there was nothing they could do to help. Freddie Mac, who owns Nancy's mortgage, sent out a real estate agent to post a notice on her door, offering her cash for keys to get out. A few days later she received a loan modification package from Nationstar. Although it seems impossible for Nancy to know what's going on, one thing is clear- the banks are still up to the same old tricks, misleading homeowners down a rabbithole that all too often results in foreclosure. Nancy's story is just one of thousands that prove that the banks are still using the same deceptive practices that the multiple government settlements were supposed to put an end to. The big banks have repeatedly violated the settlement terms, using every loophole they can find to prevent them from complying with the new rules, or transferring servicing rights to specialty companies like Nationstar, who collect more profits from foreclosing than from completing successful loan modifications. Now instead of planning for retirement, Nancy like so many other seniors in her situation is faced with the threat of losing her home. American Friends Service Committee stands with Nancy Daniell, and over 3,000 supporters have signed an online petition calling on Nationstar Mortgage and Freddie Mac to do the right thing and work out a deal that keeps Nancy in her home so she can continue to make her community a better place for all it's residents. South Eastern Housing Justice Academy In Atlanta! 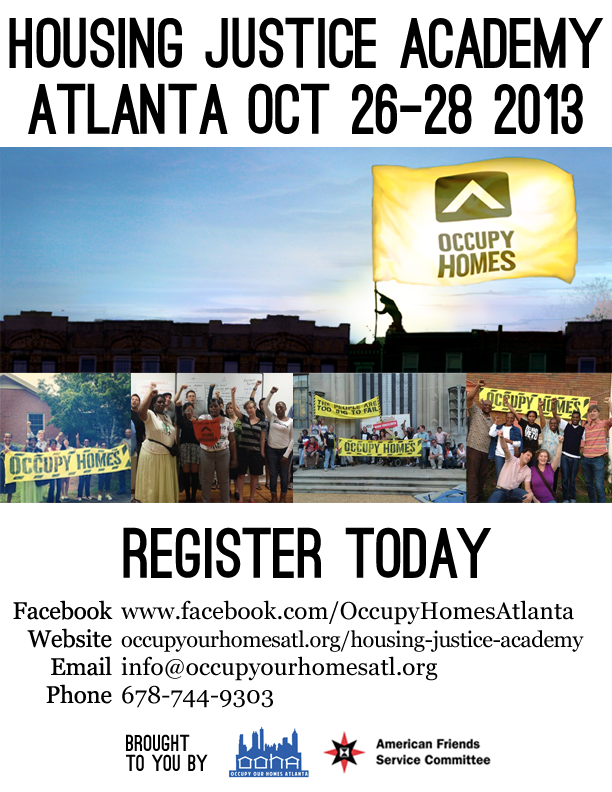 American Friends Service Committee and Occupy Our Homes would like to invite you to attend our first ever Housing Justice Academy in Atlanta October 26-28. The housing crisis has hit the Southeast especially hard. Thousands of families have already lost their homes, neighborhoods have been destroyed, and despite the media’s attempt to claim a recovery, foreclosures still continue at three times their pre-2007 levels. 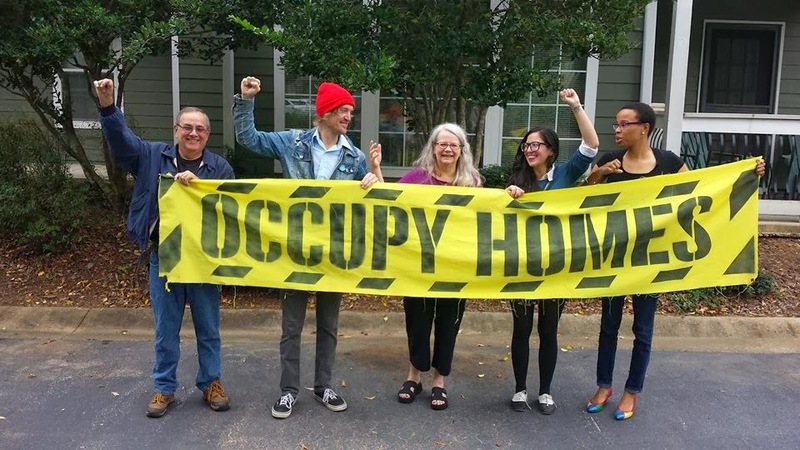 Over the last two years, Occupy Our Homes groups around the country have helped hundreds of families fight to stay in their homes- and win with! 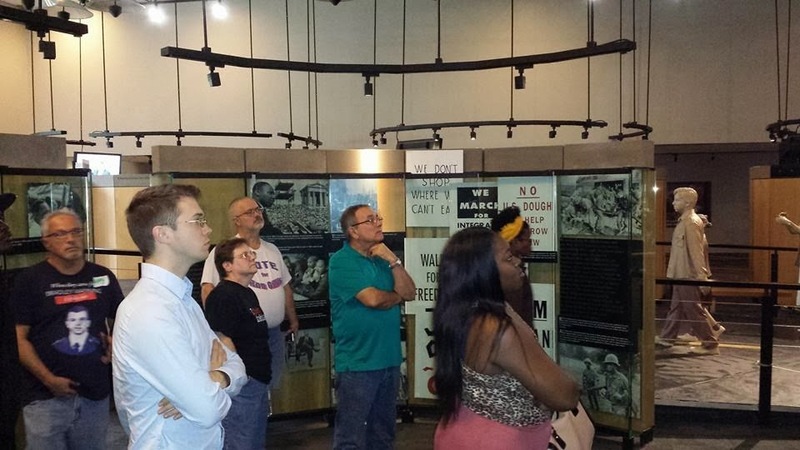 In Atlanta the American Friends Service Committee has played a key role in providing resources and organizing experience to the movement. We’ve had dozens of victories, winning homes, farms, and even churches back from the bank. We know that the only way to hold Wall Street accountable is to come together and organize–to create a world where people, not banks, have control over their communities. 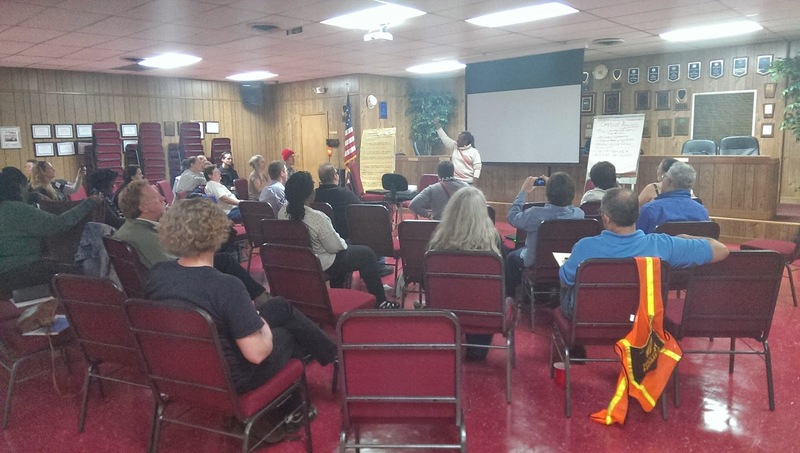 For three days this month, we’ll bring together people together to learn tactics and strategies to defend our homes, participate in non-violent direct action, and work on building a housing justice movement in the Southeast. The academy is open to anyone who would like to attend. The registration fee for the general public is $50, which will cover the cost of the trainings, materials, space, and meals each day as well as help provide scholarships to those needing assistance traveling to Atlanta. For students, senior citizens, or residents facing foreclosure or eviction, the cost is $20. We would like to encourage those who can pay this fee to do so to help support others who cannot. However, no one will be turned away for lack of funds. Childcare will be provided, and we will strive to provide lodging in Atlanta for those who need it as well. Please indicate on the registration page if you need assistance with lodging or transportation and someone will follow up with you soon to arrange it. ccupy Our Homes Atlanta and the American Friends Service Committee would like to invite you to attend our first ever Housing Justice Academy in Atlanta October 26-28. Over the last two years, Occupy Our Homes groups around the country have helped hundreds of families fight to stay in their homes- and win! In Atlanta we’ve had dozens of victories, winning homes, farms, and even churches back from the bank. We know that the only way to hold Wall Street accountable is to come together and organize–to create a world where people, not banks, have control over their communities. Click on the green button to register!